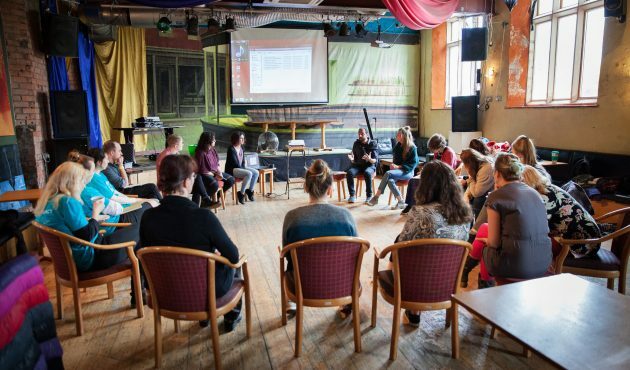 acta’s free open access quarterly seminar programme provides opportunities to get together to discuss a range of issues currently facing community arts practitioners. Seminars are attended by acta staff, volunteers and participants; academics and students; experienced practitioners from across the sectors of community theatre and community arts; and people interested in learning more. “What’s My Motivation?” is on the afternoon of Wednesday 13 March, with Francois Matarasso and Conrad Murray. There has never been more interest in the arts world in involving communities in creating work. But is it a good idea? And why do it anyway? This seminar provides a timely opportunity for reflection and debate for anyone involved in community arts and participatory practice. It will include presentations from Conrad Murray (Battersea Arts Centre) and from Francois Matarasso (arestlessart.com). acta and University of Exeter Drama Department are proud to present an extra special international seminar, to consider community theatre and arts in rural and urban communities, with a specific focus on the USA and Europe. We are particularly excited and delighted to welcome to the seminar Alex Gibson, of Appalshop, Kentucky; an inspirational community development project which grew from Roadside Theatre in the 1960’s. And on the very same day, we will be welcoming back to acta the renowned Dr Eugene van Erven (ICAF and Utrecht University). Forthcoming themes will reflect the acta programme, the communities with whom we are making theatre, and how we make change locally, nationally and internationally. Value for money; justifying community theatre and arts in a context of poverty. Annette Burghes is Executive Director of Collective Encounters, a professional arts organisation specialising in Theatre for Change. Since 2004 Collective Encounters has worked with marginalised and disenfranchised communities in the northwest of England delivering place-based participatory theatre projects that grow out of research with communities affected by poverty and inequality. Practitioners work with children in care, homeless people, those with addictions or poor mental health, older people who are isolated and vulnerable, veterans, and many others. Artists and community members collaborate to make new work that tackles some of the most pressing social and political concerns of our times. This process produces theatre that is firmly rooted in lived experience and extensive research. Productions are usually performed in non-traditional spaces to reach those who wouldn’t otherwise access theatre, and in settings that reach and engage decision makers, community leaders and service providers in debate around the issues, with a view to contributing to systemic political change.